Lucy Yang has more from Mott Haven. BRONX, New York (WABC) -- A man says he was attacked by two men while riding the New York City subway because he was wearing a Donald Trump hat. 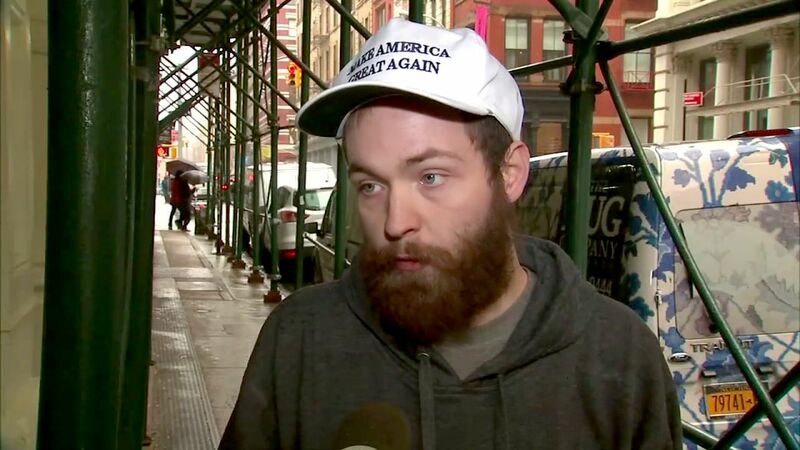 Corey Cataldo, 24, of the Bronx, said he was riding the uptown 5 train from Union Square to Morris Park Friday, when another rider on the subway spotted his "Make America Great Again" hat and apparently didn't like it. He spoke exclusively on television for Eyewitness News reporter Lucy Yang. Cataldo explained that the situation heated up as the train got close to the 138th Street/Grand Concourse station. "He asked me if I'm a Trump supporter. I said 'yeah' and thought he'd say 'me too.' People have been doing that," Cataldo said. "But no. This man was not a Trump supporter." Cataldo said the man stood up and became flustered. "The next thing I know, I have hands around my neck and I'm being choked," Cataldo said. "I try to fight him off, and another gentleman comes over, pretends like he's going to help me and says 'get off of him.' He shoves me up against the wall, up against the window." He said no one on the train did anything to help. He was finally able to escape. The NYPD has been notified of the incident, and they're looking for the two men involved. Cataldo, who is an electrician, said he is still able to work but he has lingering pain in his shoulder following the incident. He said he has "a lot" of Trump's "Make America Great Again" ball caps, and has given out many to show support for his now president-elect.